Over the decades, Patialashahi pug (turban) and Patiala peg have become significant landmarks of Punjabi folklore. There are many absorbing folk tales associated with these two vital symbols of the erstwhile Patiala royal state. The World Punjabi Conference is over. Punjabi delegates from as many as 26 countries participated in the conference hosted by Punjabi University, Patiala. A maharaja bash heralded the end of the stay of the Pakistani Punjab delegates in the city, with a rich fare of Kashmiri and Patiala cuisine being offered to them in the floodlit lawns of the New Moti Bagh Palace, residence of Chief Minister Amarinder Singh. Pained at the indifference shown by the Punjab Government during the World Punjabi Conference in taking up the issue of 76 incarcerated Sikh youths in Pakistani prisons, the International Bhai Mardana Yaadgari Kirtan Darbar Society will hold up traffic on the state highway near the PAP Complex in Jalandhar on December 15. Swaran Singh, who claims to have participated in the Indo-China war in 1965, is fighting a battle for survival today, He is awaiting his pension for the past over 30 years. Speaking to The Tribune here today, he said he had submitted applications to government officials during different regimes in the state, but to no avail. With an average of one person dying on the Mohali-Ropar national highway every week, about 200 persons have lost their lives in total accidents during the past three years on the 35 km National Highway-21. The district police is yet to devise a way to control the increasing death toll on this stretch. Even as heritage festivals are being organised on a large scale in holy city, the administration has taken little note of the dwindling heritage buildings. 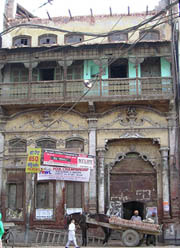 A haveli belonging to the period of Maharaja Ranjit Singh situated in the walled city here is being demolished, reportedly for constructing a shopping complex. This is the third instance of destruction of precious structures. Earlier two heritage havelis were demolished this year which too, belonged to the Maharaja Ranjit Singh era. On the ‘directions’ of a senior Congress leader and former minister, the Bhikhiwind police has allegedly registered false cases against several residents of Bhikhiwind area for favouring Opposition. Mr Parkash Singh Badal at a press conference held here today said the SGPC would celebrate the tercentenary of the martyrdom of the four Sahibzadas of Guru Gobind Singh on a large scale and SAD would extend all possible help to it in this regard. Punjab ranks third in fresh water fish farming in the country. But the state is getting the aqua delicacy from Mumbai for local consumption. This is not all. Punjab farmers are pumping in too much on too little. In fact, the farmers are spending three times more on the feed than they should be. While Dr Kirandeep Kaur, a lecturer in Faridkot, has moved an application with the National Commission For Women (NCW) for registration of a dowry case against her husband and his kin, her husband Mr Mandeep Singh Dhillon, deputy director, Technical Education Department, Punjab, has moved an application with the Bathinda police for registration of a theft case against her. Objecting to naming a club library in the civil lines area here after Guru Nanak Dev, the Sikh Front has issued a warning to its office-bearers to vacate the premises by December 31. CPI (M) General Secretary Harkrishen Singh Surjeet today paid a visit to Punjab Chief Minister Capt Amarinder Singh's Adviser Bharat Inder Singh Chahal at a hospital here. A seminar dedicated to the celebrations of the 400th Parkash Utsav of Guru Granth Sahib was organised at Sikh National College, Charan Kanwal, Banga, about 12 km from here today. It was organised under the aegis of the Sikh Education Society, Chandigarh. Dr Kiran Bedi’s India Vision Foundation yesterday launched a project for jail inmates here. The project director of the foundation, Ms Shakira N. Scolt, while talking to newspersons said they were encouraged by the response of women inmates and Superintendent S.P. Singh. Prof Prithipal Singh Kapoor, president, Master Tara Singh Institute of Studies today regretted that the Jathedar of Gurdwara Patna Sahib, Giani Iqbal Singh, had taken upon himself the task of giving judgement on a matter relating to the Panth. Two jail inmates here received minor injuries during a scuffle that broke up in the jail on Friday over the distribution of medicine. Prisoner Major Singh and an undertrial Parvez Ali were brought to the civil hospital for examination. Prof Kulwant Singh, Head of Economics Department, Guru Nanak College, Phagwara, who had recently gone to Delhi in connection with his Ph.D project had a unique experience. The Punjab and Haryana High Court today issued notice of motion for December 15 on a petition filed by a Patiala-based dental surgeon, Dr Ramesh Chand Sharma. A quarterly Lok Adalat was held in all Judicial courts, situated at Patiala, where 253 cases were taken up for settlement. Out of these 165 cases of various categories were disposed of on the basis of compromise between the parties. An amount of Rs 74787 has been awarded to various parties under the compromise. Farmers blocked traffic for three hours in front of the new grain market here today to express resentment over the non-availability of DAP fertiliser against cash payment. The scheduled and unscheduled power cuts being imposed in the state have started affecting the price of raw cotton adversely in Punjab as its demand has been going down. The Barnala police today booked five persons, including a Naib Tehsildar, for allegedly misusing a computer meant for registration of sale deeds and openly flouting the state government laws meant for execution of these deeds. Two miscreants fled with a taxi which they had hired for going to a village near Kharar. According to the police, two persons, aged about 25 and 30, hired an Indica car from Pinjore and told the driver of the vehicle, Kamaldeep Singh, that they had to go to a village 7 km ahead of Kharar. The police today arrested three youths for allegedly attacking the son of a Superintendent of Police and three others with sharp-edged weapons at New Jawahar Nagar locality here. Teachers of privately managed colleges of Sangrur district blocked traffic at a chowk near SD College here today. They were protesting against the alleged indifferent attitude of the state government towards their problems. Bagging the inter-varsity youth festival (north zone) trophy for the fifth consecutive time, Guru Nanak Dev University created a record this year. The first-ever Religious Youth Festival of colleges being run by the SGPC started with much fanfare at the local Mata Gujri College. All the 18 SGPC-run colleges are participating in this festival. The seventh annual convocation of the Sant Longowal Institute of Engineering and Technology, will be held on December 8 on the SLIET campus. A meeting of brick-kiln owners of Gurdaspur district was held here today under the District Magistrate, Gurdaspur, Mr Harjit Singh.